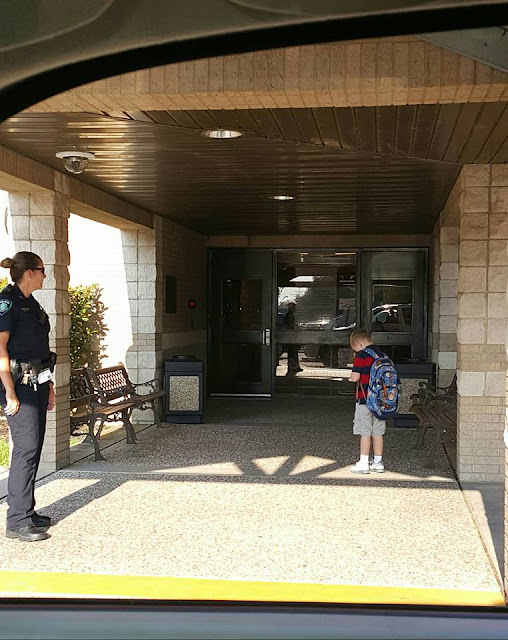 Home › pictures › Stories › Little Boy Running Late For School Stops Abruptly Outside Front Doors, Inspires Country With Pledge & Prayer. 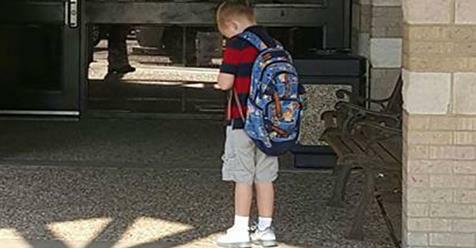 Little Boy Running Late For School Stops Abruptly Outside Front Doors, Inspires Country With Pledge & Prayer. 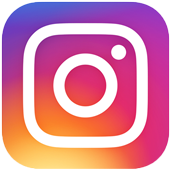 Heather Nelson was dropping her son Royce off at school on August 30th when she snapped a photo that has been viewed millions of times in the last week. Her kindergartner son stopped dead in his tracks as he entered the building, recited the pledge of allegiance and then prayed thanking God for the day he was given. As his classmates streamed around him, Royce wouldn’t budge until he was finished with his show of respect and thankfulness. A campus police officer approached Royce and asked him what he was doing, and she was blown away. “Thank you God. Thank you for giving me a wonderful day,” Royce added to the pledge in prayer. How often do we forget to be grateful for our freedom and ability to live through another day? Royce’s simple actions serve as a wonderful reminder to us all. It may take many more moments like this to make a real difference, but we are so thankful that young Royce set this wonderful example.